A hippo dance performance is truly an �earth shaking� experience. Crafted of resin, our whimsical hippo is costumed with an adorable green tutu, feathered tiara, and ballet shoes. Coming ready to hang with a gold cord, your favorite ballerina will get a kick out of this enchanting 4�� wide hippo with green skirt ornament. Hang this one on your Christmas tree or on any display stand for a sure hit. The stone resin teacup has a darling hippo peaking out and is hand painted. 2 1/2"� x 2"
The Chubby Hippo Ornament is a little sensitive about his appearance so please say only nice things around him. He's got a brownish upper body with yellow underneath and the cutest little face ever. And he's stocky, not fat. Made of sturdy rubber, our guy is hollow inside and measures almost 3" long. This adorable 1�" glass hippopotamus ornament is painted in eye-catching colors and glazes in the Czech Republic. This hippo makes a perfect addition to any ornament menagerie! No holiday tree is complete without a hippo and our grazing hippo is happy to hang out on yours. He's small but cute and seems to have a cheerful grin. Made of finely painted hard rubber, our little green hippo measures about 2" long. 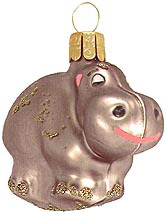 Hand carved and painted hippo figurine ornament will grace any holiday tree with a whimsical touch. Charm your favorite hippo collector with this realistic silver hippo! Our 5" hippopotamus glass ornament comes ready to hang with a gold cord and will make a wonderful addition to your ornament collection. You'll weigh in heavy with your favorite hippo collector once they see this happy herbivore in their tree! Measuring 4�" wide by 4" tall and crafted from glass, this hippopotamus will warm your heart with his festive hat and coat! Coming ready to hang with a gold cord, this hippo in jacket ornament will make a wonderful addition to your ornament menagerie for years to come. Ready for a night on the Christmas town, this gently glinting gentleman hippo is fashionably attired in his top hat and holiday scarf. Mr. Christmas Hippo is made of resin and approximately 4� long x 2� in height. Playfully adorable, this hippopotamus couple is ready for a ton of fun in your tree for years to come! Colorfully crafted from resin, this 2�" tall ornament comes ready to hang with a gold cord and makes a cute gift for your hippo enthusiast.